Most desktop email clients have one big problem, that becomes apparent over time: They do not offer email archiving or backup options. This means that the email databases will increase with every email, which in turn can have an impact on the performance of the email software. It should be obvious that it takes longer to load an email folder with five thousand emails, than one with ten. The main purpose of email archiving and backup software is to offer fallback copies if the emails and mailboxes in case they get corrupted or deleted on the main storage device. Many desktop email client users do not backup their mail databases regularly, which can end in disaster if the mailboxes get corrupted. The same applies to companies and businesses, but with dire consequences. As a side effect, archived emails can be moved to another storage device or server, so that they free up disk space on the hard drive that the email client uses to store the email database. Today we are going to show you how to speed up the email client Thunderbird, by archiving part of the stored emails. The idea is to combine backing up emails regularly, with the benefits of being able to remove emails from the email client that are old and not needed on a regular basis. In case they are needed they can still be accessed in the archiving software. 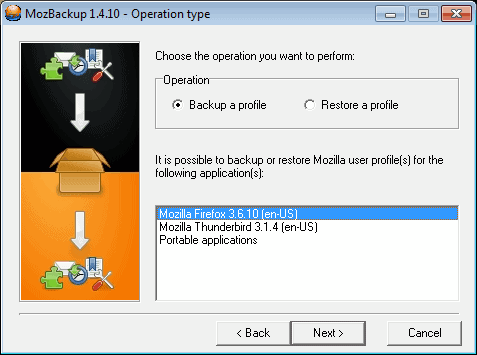 Before we start, we are going to create a full backup of the Thunderbird profile with MozBackup. 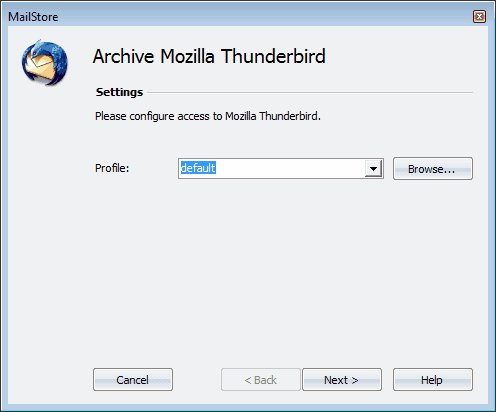 Just download and run the backup software, and select to backup the Mozilla Thunderbird profile. Make sure all data is included in the backup (default settings). The program can later be used to restore the full Thunderbird profile in case that is needed. Windows users have the option between several email archiving programs. For the purpose of this tutorial, we are going to use Mailstore Home. The program makes it almost foolproof to archive emails from various email clients, including Thunderbird, Windows Live Mail, Microsoft Outlook, Google Mail and general IMAP and POP3 mailboxes. The program includes options to search and read emails directly in its interface. It takes only a few clicks to archive emails in MailStore Home. A click on Archive E-Mail opens the archiving page of the software. Here it is possible to select an email client or protocol from the list to launch a wizard. The default profile is the standard profile. Most users will probably only have the default profile, unless they are working on a multi-user computer. Here it is possible to select all email folders for backup, or only specific ones. It is furthermore possible to filter emails by data or status. The archiving can take some time, depending on the number of emails stored in the Thunderbird mailboxes. MailStore Home displays the saved profiles in a listing on the archive e-mail page. The program saves all information, including email attachments and headers in its interface. We suggest to archive all emails on the first run. This is important as it makes it easier to delete emails in the email client afterwards. Delete emails? Yes, to speed up Thunderbird emails need to be removed from the client. The next step depends on the user and the folder structure. A user only working with the inbox may want to delete all emails older than a specific age, and do the same in the sent, trash and junk folders. This should reduce the size of the mailboxes considerably in the email client. Finally it is important to compact the folders after deleting the emails in the mail client. Like other email clients, Thunderbird does not physically remove the emails from the mailboxes after they are deleted by the user. This is done by compacting the folders. The option is available under File > Compact Folders. Before it is selected, a folder in the mail structure needs to be selected. Hint: It is possible to configure Thunderbird to automatically compact folders by clicking on Tools > Options, switching to the Advanced tab, there to the Network & Disk Space tab, and enabling Compact folders when it will save over x KB. 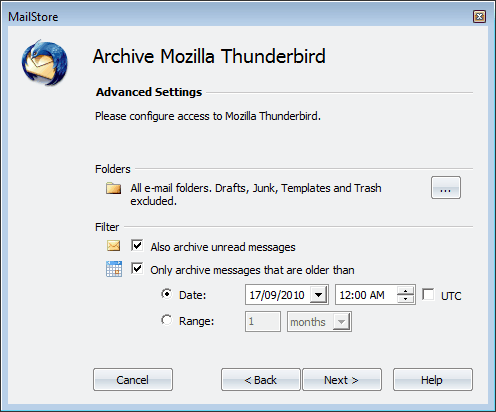 Thunderbird may start up and feel noticeably faster after archiving and deleting emails in the client. This largely depends on the amount of mails that have been stored in the client prior to the operation. A user with a few hundred mails will probably not notice a speed improvement at all, while a user with tens of thousands of emails likely will. Do you archive or backup your emails? Let us know in the comments. Nice application. All this could be prevented by Thunderbird/Opera Portable user Just by making a copy of the whole folder of the program when they think it’s too big and work on the new copy where all the old emails have been deleted. Argo, yes that is an option. This does however mean that the user would have to import the folder back into Thunderbird whenever an old email needs to be accessed. The major benefit of an archiving software is that the mails remain accessible after the process. Martin: misunderstood…I meant to say the user can copy the whole folder where the client is contained, so you’re saving mail AND client (it’s all completely portable! ), in a folder called “thuderbird aug09-sept10” e.g. …you follow working with a new copy of the client without need to set again server, preferences, etc., you just delete old emails in the new copy…so no import is needed, just browse the old folder and open the old client when you need. If the amount of mail is so huge to need a backup, the extra weight of the client in each copy is trifling and avoid possible future incompatibility between the mail client and the backup software. I see, now I understand. I thought about that for a moment as well, to make use of portable Thunderbird clients. That’s a valid option. just a question: how MUCH emails does it take to slow down an email client? Just wondering because I’ve kept over ten years of emails in a simple tree system under my ThunderBird \Read\ and \Sent\ folders, each with their yearly contents (i.e. \read\1999 & \sent\1999 …/… read\2010 & sent\2010, oldest imported from Outlook) without noticing a slight slowdown of my hand grabbing the beer next to my monitor. No, seriously, how much email (size and number) slows down a client? I’d bet on having a slow processor, not enough memory, or too many applications opened at the same time, but not on the contents of an array of entries in a database. Unless you store the library of Congress. I don’t want to die stupid, I want to learn, and I’ve found MozBackup excellent enough to “externalize” my data as a backup. Why more of more? jfjb, that depends largely on the computer used, obviously. A lot of emails may influence performance in the client, it may for instance take longer to display emails in an inbox, or open the program. Martin, in your opinion, is it better IMAP or POP protocol to use in a corporate place? IMAP has a lot of advantages, but I cannot loose any of them. Both have their advantages. IMAP requires a solid mail server though, especially if large mailboxes are maintained on it but it usually has faster response times, server side searches or the ability to only retrieve textual information. You may also want to try TEBE (http://tebe.softwarebychuck.com). It does for Tb what FEBE does for Fx. You can have it backup just selected parts of Tb instead of a huge file that contains everything. TEBE is still beta and works only with Tb 3.x, but it has been around for a couple of years. I’m still trying to find what would be the best option to adopt in a company where the email is used for legal purposes. I mean, there are a lot of important documents. And thay has to be always available. Great article, and MailStore worked great for me. Just one thing– is it possible to combine two MailStore archives into one? I had an archive of some older emails, and forgot that I had it when I archived again. Now I have two archives of the same folders, but from two different time periods. I’d like to be able to combine the two archives, and just maintain one, making it easier to search and manage. In any case, thanks for the great article! Thanks for the interesting tools. i just stumbled about this very fine tech-blog and added ist to my favs just after a few pages i read. This thread is one year old since last entry, but things have changed. Recently i use your advices to move my stuff away from Google, GMX and T-Online to some nice private hosters. Okay,- the NSA got my data already, but it’s nice to have a backup on my own. Also i have several netbooks with diffrent profiles and it would be nice to have the archives available on all of them. Keep on doing what you do – a great job! Thanks! Thanks, I try my best to post unique content on a regular basis. So do i. That’s the reason why my blog is kind of slow. Ever heard about http://ms5.eu ? Free (ADFREE!) webspace. Good for beginners, because this space ist fit and working fine with Joomla (and Akeebay and other stuff which need chmaod and 777rights and stuff). Costs: 0,00€. Also https://uberspace.de/ is a good thing in my opinion. Pay what you can pay, symbolic 1€ minimum per month, 1st 30 days test free. NO DATA COLLECTING! Getting a 10 GB pace is easy as sending an email. I do not get a penny when recommending the URLs abobe. They do a good job. That’s all. I tried this, but Mailstore Home did not purge the email from the TB folders – it merely made a copy of it in the archive based on the parameters I selected. It also will not archive to a network disk, which I can work around. You can delete the mails manually. There are hundreds of subfolders. There has to be a better way. Another thought I had to get round the problem of too large a profile was change from POP to IMAP. I’m very nervous about doing this as I don’t want to lose visibility of my existing POP emails. Is there a simple tutorial for ignoramuses like me showing how to do this change, and are there any pitfalls I should look out for?